It’s Throwback Thursday so let’s go back through Upper Deck’s trading card history and come up with a fun giveaway. The College Football season has been intense, especially in the SEC; Auburn Tigers and Ole Miss Rebels face off against each other this weekend and it is a crucial game for both teams. After the Rebels upset Alabama Crimson Tide and the Tigers fell to Mississippi State Bulldogs Ole Miss is looking like the favorite going into the weekend. 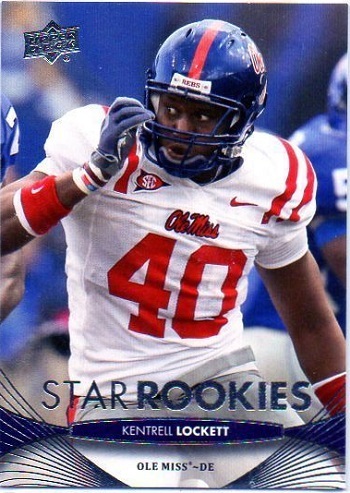 So let’s put up a throwback card of a memorable Ole Miss player, non-other than Kentrell Lockett, and see if our fans can come up with some great captions for the card! Please share your comical caption to this card for your opportunity to score 10 packs of 2014 Upper Deck Conference Greats Football Cards! You have until Friday morning, October 31st at 8:00 a.m. PT to post your caption before this promotion is closed. This is Agent Lockett reporting, I’m after a bogey going down the endzone and am in need of backup! Ooh, Ole Miss really is an “old Miss.” Wasn’t expecting that! Who said “clowns”?!?! I hate clowns! You picked THAT PHOTO for my rookie card?! Is that Verne Lundquist dressed up as a chicken for Halloween?! This hand is so scary! Opps I Have On Someone Else’s Helmet, Ebola Scare. I thought I saw an Auburn Tiger behind me. I DID I DID SEE AN AUBURN TIGER BEHIND ME!!!!!!! I think i seen a ghost. Call the Ghostbusters. Oh man, here comes that Mississippi State bulldog again! Good thing UD makes college cards because I will never make big in the NFL. There’s a spider on my face mask! I hate spiders! Don’t look. Don’t look. Oh Dang, I looked! I ain’t afraid of no ghost….. but that’s a hand! Hey Coach, can I do some “Trick or Treating” at halftime please? why is my hand face masking myself? Upper Deck did what with my jersey! Why is a deformed pumpkin zooming toward me? Oh wait that’s a football! You won’t believe this a Ma!! I got a Tiget by the tail!! That is the BIGGEST spider I’ve ever seen crawling on my face mask! Congrats to Matt G.! His witty comments scored him 10 packs of 2014 Upper Deck Conference Greats Football Cards! Thank you to everyone for participating and hope to see your comments again soon.